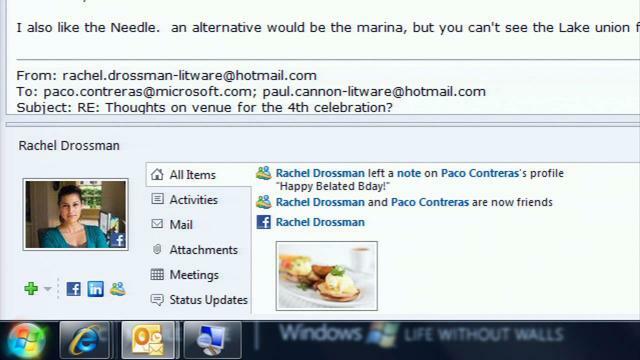 Microsoft Outlook integrates with Facebook! Microsoft today announced that it is integrating Facebook and Windows Live Messenger into Outlook. The new outlook now has these streams that will let users to access streams from Facebook. Microsoft could get many more potential users for Outlook with this move, possibly millions more! With the launch of the Outlook Social connector plugin Microsoft had made it clear that it will work with major Social networking sites. The plugin syncs social networking feeds into your Outlook and gives you immediate updates on what they are doing and thinking. Intially Microsoft started out with LinkedIn integration but soon the company moved ahead with Myspace and Facebook. Outlook is not just set to integrate with Facebook but also has support for the Windows Live Messenger. Microsoft also announced that it will be releasing a plugin for Outlook 2003 and 2007. Outlook’s Facebook integration does have its own limitations. Except for friend requests where you can approve or send a request out, Outlook can only pull data from Facebook. You cannot “like” a post or update your status via Outlook. Microsoft says that the next step is to provide a richer social experience by integrating the ability to push data to other social networks and improving the look and feel of Outlook Social Connector.